The North Node of the Moon is called RAHU in Vedic astrology and the South Node is called KETU. They are called dark or shadow planets, because of the Nodes' association with the phenomena of eclipses. They have no sign ruler ships, although they are said to favor Mercury and Jupiter's signs according to some authorities, while others claim that Rahu favors the sign of Aquarius and Ketu the sign of Scorpio. Rahu, the North Node of the Moon means to conceal, engulf or hide in Sanskrit. This Graha is associated with the world of material manifestation and worldly desire. Rahu is associated with the spiritual process of evolution, or the engrossing of spirit in materialization. Rahu is a karaka, or indicator, of worldly desire, fame, greed, high intelligence, manipulation, obsessive behavior, foreigners, mass disease, dementia and inertia. The nature of this Graha is Vata, or Airy. He's the significator of an irreligious person, outcast, harsh speech, logical fallacy, falsehoods, uncleanliness, abdominal ulcers, bones, and transmigration. Rahu is instrumental in strengthening one's power and converting even an enemy into a friend. Poisonous snake bites can be healed by the grace of Rahu. In Buddhism Rahu is one of the krodhadevatas (terror-inspiring gods). Rahu professions: Rahu is a legendary master of deception who signifies cheaters, pleasure seekers, operators in foreign lands, drug dealers, poison dealers, insincere & immoral acts,etc. Rahu diseases: It gives suicidal tendencies, fears, phobias, poisonous bites, murder, theft, imprisonment, and diseases like cholera, dysentery, skin diseases, swelling of the uterus, and constipation. Rahu Signs: Friendly signs are Gemini, Virgo, Libra, Sagittarius, and Pisces. Cancer and Leo are its enemy signs. Mercury, Venus, and Saturn are friendly planets. Rahu is an enemy of Sun, Moon, and Mars. Rahu gives auspicious results in Taurus and Libra. Rahu is capable of giving power when rightly posited or exalted, and it gives fame, success in politics, money, and physical beauty (i.e., attraction). Rahu behaves like saturn: Rahu is regarded as similar to Saturn in its effect. Smoky blue is its color, instinctual and animalistic its nature. Rahu is interested only in achieving all that gives pleasure, and even if it achieves all it wants, it is never satisfied (which is true of our animalistic nature). Although Rahu rules no sign of the zodiac, the zodiacal sign Virgo is its sign. Virgo is in fact assigned to Mercury, but Rahu being akin to Saturn and Mercury being a friend of Saturn, Rahu thus has authority over Virgo. Rahu god of chemical industry: Rahu governs all sorts of poisonous chemicals like fertilizers, pesticides, and disinfectants that are in use in the present times. It also governs all the substances with a strong pungent smell like the sulphur-dioxide gas. In other words Rahu has a role to play whenever a poisonous substance is involved. There is no equal to Rahu when it comes to giving Upliftment in Name and Fame , Sudden Luck Gambling, which is probably the reason why Western astrologers regard it as the greatest benefic force. The gemstone associated with Rahu is a honey colored hessonite (Gomed). Its element is air and direction is south-west. Rahu reaches full maturity at age 42. 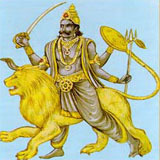 The Puranas describe Rahu as half-bodied, born of a lioness, snakelike, having a huge body and being extraordinarily powerful. The Skanda Purana says that Rahu is instrumental in strengthening ones power and converting even an enemy into a friend. The effect of snakebite is removed by his grace. The lunar and solar eclipses are attributed to Rahu and Ketu. Rahu and Ketu stay 1 1/2 years in each Graha. Rahu and Ketu story: There is a story in the Puranas that tells of the God Vishnu dispensing AMRITA,the nectar of immortality to the Devas. While Vishnu was dispensing this amrita, a demon, Rahu mingled with the Devas and was receiving the amrita when the Sun and the Moon discovered him. With the luminaries calling alarm, Vishnu threw his discus (Soodarshana Chakra) at Rahu and cut off his head. But, Rahu had already drunk the Amrita and now remained an immortal head, disassociated from an immortal body. Rahu is the strongest enemy of Sun and Moon. There is much lore and mystery surround the Moon's Nodes in Vedic myth, and they are considered of paramount importance in chart interpretation. In fact, in assessing planetary power, the only Graha that is more powerful than the Sun is Rahu, the North Node of the Moon, because of his ability to swallow the Sun during a total solar eclipse. Which is the bad color for rahu and ketu ? Rahu is one of malefic planets, we should pray durga devi when we affecting by rahu, durga kavasam, durga pooja can reduce the effects of rahu. Rahu is exalted in aquaris..not gemini or virgo..coz this is the positive house of saturn..secondly rahu gives effects like the planet on whose rasi or nakshatra it is situated...not neccesarily like saturn..